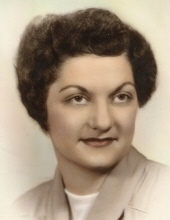 Jean C. (Lang) Decker, 88, of Fostoria, passed away on March 18, 2019, at ProMedica Toledo Hospital. She was born December 6, 1930, to Raphael Joseph and Theresa “Rose” (Brickner) Lang, in Fostoria. Jean married Clyde Eugene Decker on June 28, 1952, at St. Wendelin Catholic Church, in Fostoria, and he preceded her in death on July 15, 2010. Surviving Jean are her children, Nanette “Nan” (Jim) Schuett of Fostoria, Paulette Taylor of Punta Gorda, Florida, and Molly (Ed) Johnson of Fostoria; six grandchildren, Jamie Taylor, Kris (Chuck) Grine, Cory (Max) Reinhard, P.J. (Thad) Siebert, Amanda Jordan, and Perry Johnson; nine great-grandchildren, Nicole, Andrea, Madison, Quinn, Brock, Reese, Mesa, Olivia, and Isabella; and six great-great grandchildren. She was also preceded in death by her parents, and siblings, Marvin Lang, Marion “Pete” Lang, Alma Steinbaugh, Earl Lang Sr., and Viola Lang; as well as a son-in-law, David Taylor. Jean was a cook and worked for various restaurants, including the Elks and The Black Cat. She was a member of St. Wendelin Catholic Church. She and Clyde were also members of the Eagles, Moose, and VFW in Fostoria. Jean was an avid reader, enjoyed gardening, and she loved to go dancing with her husband, Clyde. Visitation will be held from 5-8 p.m., on Thursday, March 21, 2019, at HOENING FUNERAL HOME, 242 W. Tiffin St., Fostoria, where a wake service will begin at 7:30 p.m. A Funeral Mass will be 10:30 a.m. on Friday at St. Wendelin Catholic Church, where a Rosary will be prayed at 10 a.m. In Lieu of flowers, memorial contributions are suggested to St. Wendelin Church, The American Heart Association, or St. Catherine's Care Center of Fostoria. A funeral luncheon will then be held in St. Wendelin Parish Hall. Interment will be private. Jean will be laid to rest in Knollcrest Cemetery at a later date. Online expressions of sympathy can be made at www.hoeningfuneralhome.com. To send flowers or a remembrance gift to the family of Jean C. Decker, please visit our Tribute Store. St. Wendelin Catholic Church A Rosary will be prayed at 10 am. "Email Address" would like to share the life celebration of Jean C. Decker. Click on the "link" to go to share a favorite memory or leave a condolence message for the family.